But in presenting his theory of facilitated variation, the authors merely seem to be trying to develop a more complex (convoluted) theory of evolution that seems to point to intelligent design, while relying on the same old arguments that they apply to natural selection – that this natural process is the working mechanism for macroevolution (which creationists deny, saying that it is merely part of the built-in adaptation mechanism). Now we know that the way the animal is constructed is like Lego blocks – these are common, rigid, non-interconvertable pieces, but they have amazing capacity to be linked together in new forms … so you can make a soccer ball or Eiffel tower out of Lego blocks … and the components of our cells are built in such a way that although they are not malleable, they can be readily assembled into various shapes…. The whole system is built to be retooled and to produce functional outcomes. The idea he presents is that the organism has an “amazing ability” to adapt – i.e. he is saying that the cells are “built” (read “designed”) to adapt and support mutation when it occurs in order to move evolution forward. But what he is really admitting is that the design of the organism is amazingly able to adapt, and he is hoping that this will enable it to evolve based on random mutations. This is the same argument that evolutionists use when mentioning natural selection – even creationists agree that it occurs, but creationists attribute this to adaptation and variation within the kind, while evolutionists (vainly) hope that this mechanism will preserve genetic mutations which have some advantage (which we almost NEVER see in nature – i.e. it goes against all practical science) and lead to macro-evolution beyond mere adaptation. Creationists (rightly) contend that the organism is conserving and repairing its genome, not incorporating these changes (since most are bad and at the cellular level, I doubt the repair mechanism can tell if a mutation will give a phenotypic advantage). 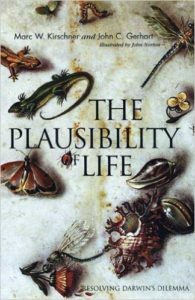 The author’s interview reveals something – not that evolution is more likely, but that life is even more complex and intelligently designed than we previously thought. The more I consider the battle over evolution, the more I think that, as a theory of science, it is harmless, if not fairly useless (see Why Do We Invoke Darwin from The Scientist). However, as a philosophy or origins, and as a world view, it is important because if it is wrong, it is hindering science, and more importantly, many people reject biblical faith because they believe that the bible is wrong, and that evolution can explain our origins without God. Sure, there are theistic evolutionists, even Christian ones. But I don’t think you can maintain a consistent, integrated xian theology and believe in evolution, except in the most liberal sense. Nor is it possible to maintain a consistent, integrated Christian theology and make claims for creationism, except in the most dishonest sense. Is that also conservative? It's impossible to maintain any argument for any form of creationism without resorting to whopping tales within a few minutes. Evolution doesn't deny God. The church shouldn't deny facts and make false claims. If "liberal" means "accurate and honest," then we should all strive to be liberal Christians. I should have read your piece more closely — you link to an article by Phil Skell, one of the most shameless disinformers about evolution with a Ph.D.
Apart from ignoring the chief anti-creationism point of the book, that organisms adapt to change in development, which means that it is not necessary for a mammal, for example, to mutate longer muscles with longer bones (the muscles grow to match), you failed to make the argument without resorting to a huge canard. You may not have recognized it (it came wrapped in a Scientist opinion piece — how were you to know such a science magazine would publish wacko stuff by scientists in their opinion pages? ), but there it is. There are no other arguments for creationism that are not similarly flawed. Ed, I’ll check out your links. 1. Evolutionists try to take a known adaptive mechanism and propose that it makes evolution work – but just like w/ natural selection, it’s a big leap of faith (since evidence is scant at best) from these adaptive/repair mechanisms to macroevolution. 2. It’s humourous, if not tragic, that the author has to use language that indicates a designer (“built”), and is amazed at the design of the system, all the while saying that this is his argument for why no design or intelligence is involved. Doesn’t anyone else see the humor in this? Even a parody couldn’t be any more wickedly humorous.